Hey there! Thanks for dropping by girlwhoknitsandpurls! Take a look around and grab the RSS feed to stay updated. See you around! 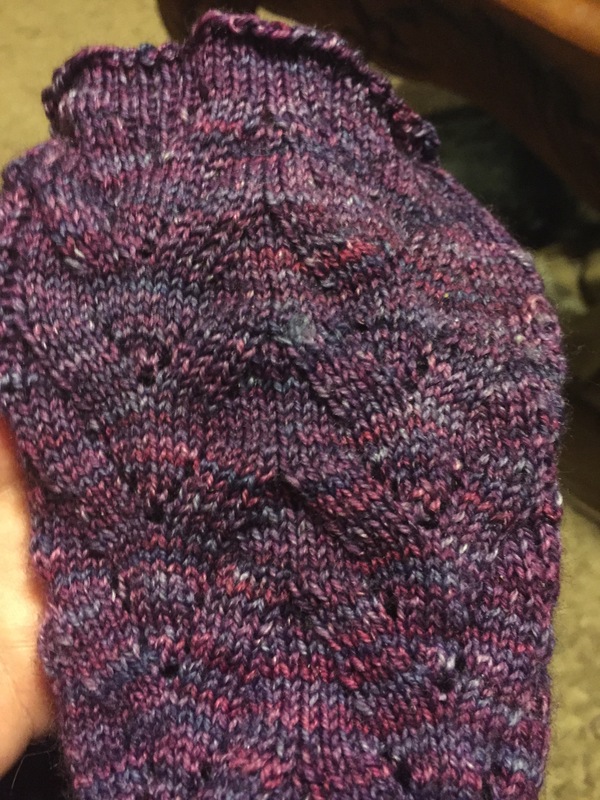 As my title suggests, this is part 2 of my adventure in knitting a patterned sock. This is the first time I have followed a pattern to make a pair of socks. The previous attempts at making socks were basic sock techniques that showed me how to make them. They didn’t fit like they should have. The instructions taught me top- down socks and toe-up socks. The socks that I called my Southwestern Socks were made with Liat Gat’s toe-up sock class using Magic Loop. Those socks grow on my feet. They fit a little loosely when I first put them on, but by the time that I have worn them for an hour or so, they have grown so big that they move around on my foot. The heels do not sit on my ankles like they should and I have decided that I will wear them until I wear holes in the heels and I will make some more that fit better. You know practice makes perfect, right? If I keep doing socks eventually I will get them right and have a perfect pattern that works for me and that fits my foot correctly. That brings me to the socks that I have on my needles now, my Azurea socks. For those of you that don’t know, these are toe-up socks that are designed for people who have ankles that are larger than the average ankle. I happen to have a fatter foot than most people due to having edema (swelling) in my feet and legs. That is one of the fit issues that I have. Not all sock patterns will work for me. I will most likely have to adapt any pattern that I try to do. Toe-up socks seem to fit my foot better than top-down socks do. Granted, I haven’t made a patterned top-down sock yet. I suppose I need to do that before I decide that top-down socks aren’t for me. I will have to give top-down a try with a real pattern first. I have heard many top-down enthusiasts say that they get a better fit with top-down sock patterns than toe-up socks. Right now, I am loving how this toe-up sock is fitting my foot. It is the perfect length, the heel turn was actually turned where my heel is instead of half way up my ankle! I am using a 2.25 mm needle to make my socks. The needle itself says it is a size 1, but I think not. I think a size 1 is 2.5 mm. I switched to a 2.0 mm needle, US size 0, to make my toes and my heels so that I would have a nice fit there and the wear would be better. I am finding that I tend to wear out my socks on the toe portion and the heel part. I just realized that I wore a hole through the toe portion on a pair of socks that I had made for me from a seller on Etsy for Christmas! So, they lasted for about 5 months. I have to find a way to make socks that last longer than that! I am going to figure out a way to make a better fitting sock that doesn’t wear out so quickly. My commercially made socks have lasted me for years. Why don’t my handmade socks last longer? Am I wearing them too much? I am going to needle felt the hole in these socks and try to make them last longer. Anyway, I digress. I am currently working on the leg for this sock. I am only making 1 at a time, so any mistakes that I made with this sock, I won’t make with the next one, right? Sure, Linda.. You will make other mistakes with the 2nd sock, LOLOL! I didn’t realize how much a difference of 0.25 mm in needle size would make either. The fit is tighter than my other socks. They fit without moving around on my foot, and I suppose that is the way that they are supposed to fit, right? The stacked tulip chart is making the socks look like they have cables in them, but it is just a series of SSK’s and K2tog stitch combinations made with strategically placed YO’s to create the tulip pattern. It really is pretty. 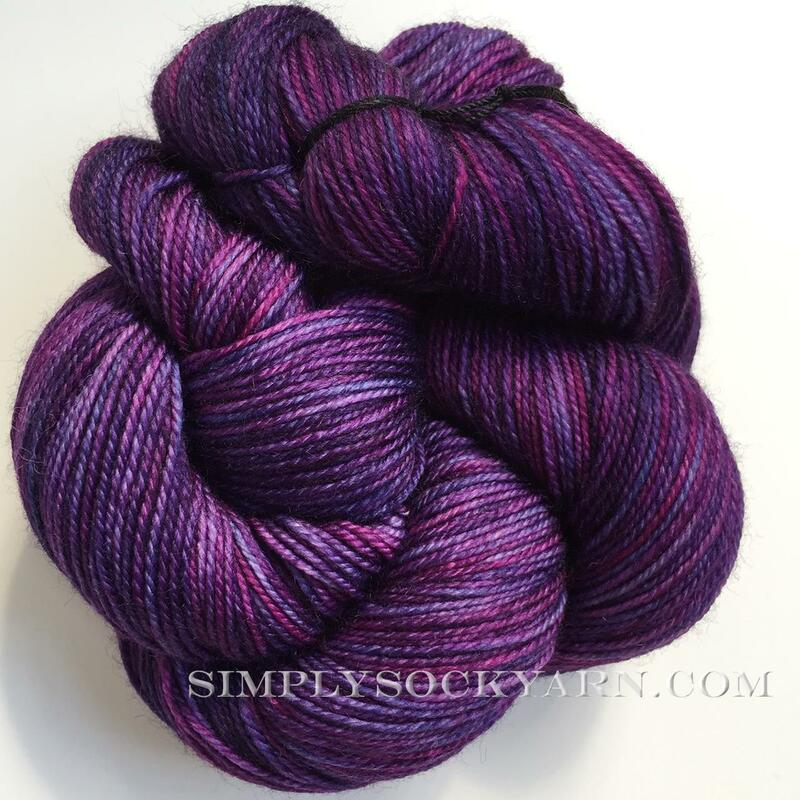 Here is the picture of it from the SimplySockYarn web site. Isn’t it just gorgeous? I have not taken any pictures yet of my almost finished sock. I am waiting until I finish both of them before I post pics of either of them. I have never purchased sock yarn at full price before! I usually get my yarn from companies that sell them at reduced prices, like Little Knits. Most of my stash came from there, my LYS when they were having a sale, eBay, Paradise Fibers when I got a huge discount for buying yarn from them, that kind of stuff. I paid full retail price for this yarn, and wearing socks made from it is going to feel really good! I certainly hope that is the case anyway. I am gonna sign off for now. I will talk to you again real soon! Have a great Memorial Day holiday with lots of good food and friends gathering around to have fun together! 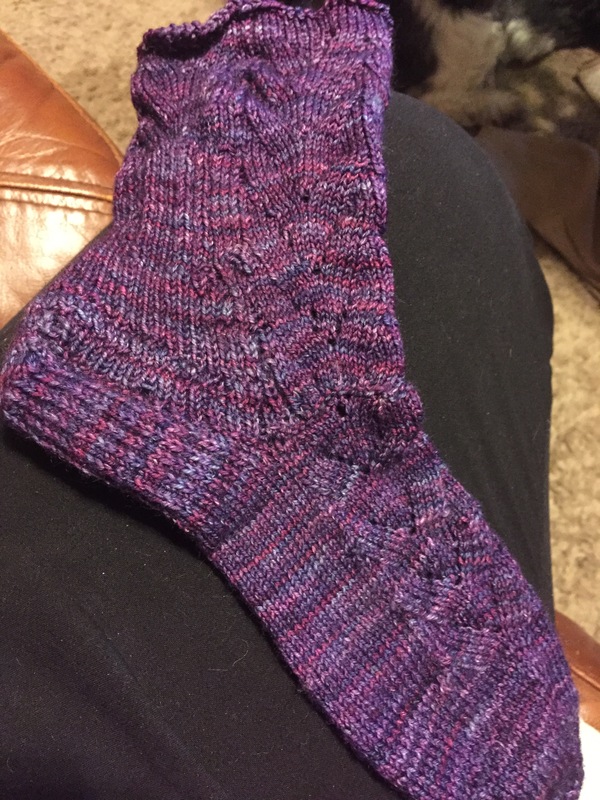 I am editing this post to add a picture of the first completed sock. I know that I said I was only going to post when they were both done, but I changed my mind. I decided that I wanted to post this first sock, unblocked. I will wash and block the sock and show what a difference it makes later this week. I still have to wash and block the sock plus allow for drying time before I can post those pictures. I hope you enjoy the pictures! The first one, on the left, is an up close look at the stacked tulip pattern with the lace. The second one, on the right, is the completed sock. Look for another post when I have washed, blocked, and dried this sock. I have started on the second sock this morning. It will be interesting to see how it changes from the first sock versus the second sock. I wonder if I will make the same mistakes that I made with this first one. I am guessing that I won’t, but I think I will probably make different mistakes. I can’t knit without making mistakes and I wind up frogging or tinking back to correct more mistakes than not. How many of my readers frog your project versus tinking back to the error to fix it so that you can keep going without having to frog the whole thing? I tend to put a lot of lifelines in, especially on a lace project, so that I if I do have to frog something, it is a minimal redo just back to the last lifeline so that I can continue on from there. It still hurts my heart to have to frog anything back to a lifeline or worse to frog the whole project and start completely over. Hello there! Long time no see! How many stitches will this cable hold? The sleeves are almost done!! I write, I paint, I knit.